I went to the Belco markets on the weekend with the aim of picking up some miscellaneous seafood mix to make a linguini marinara when I spied some butterflied sardine fillets at the fish shop and thought 'Oho i'll have some of those!'. But then what? 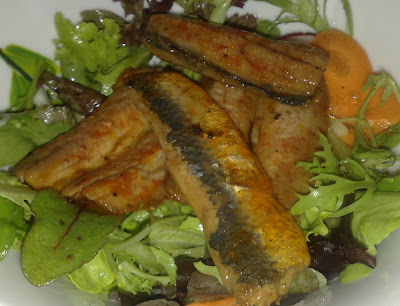 I initially had lofty ambitions of pickling and/or salting them to get a sort of boquerones type result, but then i got lazy and thought that there had to be a better (easier) way. The internet yielded some very interesting results that inspired me to try and this was I got. The result was so delicious that I had to run to the proverbial hills and tell all and sundry about the greatness that is Sardines Escabeche. The recipe can be found here and to be honest while I don't know how authentic this version of the semi-cooked pickle (which is essentially what an escabeche is) is, it tastes so damn fine that you'll now be looking at the humble tin of tuna or sardines with mild or intermediate disinterest. I added pieces of the sardines into a green salad tossed with sliced radishes and fennel (ahh spring!!) to a great effect.